Miami, FL / ACCESSWIRE / August 13, 2014 / Green Coffee Bean Max has created a buzz in the weight loss market as it actually shows positive results. In a study performed at sixteen obese people in the San Diego American Chemical Society, the product showed its magic. These people, in turns, took a low dosage of green coffee bean max, a high dosage of green tea extract and other weight reducing supplements. In a few weeks, salient results were observed. The subjects who took the full dosage of green coffee bean max lost over 17.5 pounds in just 22 weeks reducing the overall body weight by 10.5%. Unlike all other coffee beans that are roasted at 475 Fahrenheit, Green Coffee beans are unroasted. Roasting the coffee beans impart a darker color and devoid them of natural fat burning and antioxidant compound-chlorogenic acid. Various clinical tests have proved that unroasted green coffee beans are enriched with chlorogenic acid. This charismatic component has countless abilities. It aids weight loss, alleviates aging signs, prevents cancer, maintains blood sugar level and augments overall energy level with no side-effects. 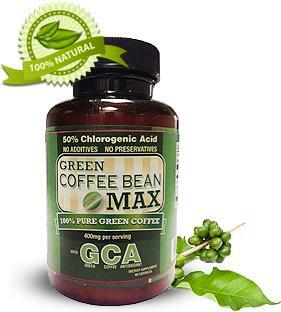 Enriched with chlorogenic acid, Green Coffee Bean Max is 100% natural, entirely made with pure green coffee beans with no additives and preservatives. Recommended by doctors, it is completely safe to use and helps shed stubborn weight. Along with boosting up weight loss, chlorogenic acid has anti-aging, anti-hypertension, anti-cancer and several other beneficial health properties that helps in long-run. It comes with 30 days money back guarantee. If you do not get results in 30 days, they will be happy to refund your money. Order today and get up to 3 free premium bonuses. - 1st bonus- You will get free membership of our weight management club with online fitness programs.